I was surprised at this one. I hadn't intended to read the book, but the boys brought it home from the library. Seeing it was a Marvel Knights title, I told them that they couldn't read it until I checked it out. I'd heard of District X a while back and knew it was a crime drama in the X-men setting with Bishop as a main character. Nothing about that really appealed to me. On reading it? 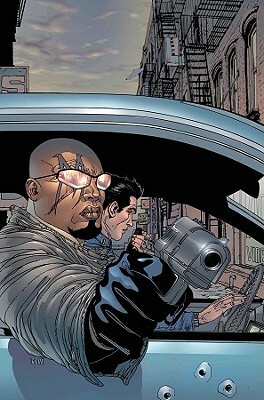 Bishop was a secondary character and the story largely focused on a Cuban police officer whose wife is a mutant. The story and the characters were very interesting and the setting turned out to be a big part of why it was so good. I'd recommend this one. Continuing the x-read of 2017... And wow. This one shocked the heck out of me. So good. So unlike other Marvel titles that I have read. A good plot with some great twists and a lot of social statements that aren't made easily or in an offhand manner. Honestly, this is one of the best X-comics that I have ever read (though it hardly counts as an X-comic in a lot of ways...). Maybe it was just the right time, but I really really dug this story. Interested to see what the next volume brings. Reprints District X #1-6 (July 2004-December 2004). Ismael Ortega and his partner run into trouble on a call in Mutant Town where the greatest concentration of mutants are all trying to live together. With his partner hospitalized, Ismael finds himself with a new partner in the mysterious Bishop. A war is breaking out between mutant gangsters Kaufman and Zapruder over the mutant drug Toad Juice. As Bishop and Ismael try to stop the war, a mysterious man known as Mr. M could be the key…or could destroy them all!Written by David Hine with illustrations by David Yardin, Lan Medina, and Mike Perkins, District X 1: Mr. M was part of Marvel Comics’ Mark Knights line of comics. The comic spun out of Grant Morrison’s New X-Men series and was collected in two volumes (followed by a limited series called Mutopia X).I actually really liked District X. I’m a big fan of the police drama like Law & Order and in particular, the police portion of the show. This comic combines elements of something like that with Alan Moore’s Top Ten and Powers (which it does steal from).The concept of a “normal guy” investigating mutants with a mutant isn’t original, but District X is fun. I like characters created by Hine and he shows (in this volume) that even some of the minor characters get a chance to develop. You would think Bishop would be the star of the series, but Hine smartly makes him the costar…allows for a different read than most X-Men comics.The art for the comic is also strong. It isn’t a comic filled with costumes and goes for a grittier “real” style. I do have a bit of a problem because every character apparently grows root-y looking things when they become mutants. The artist could have had more fun with the art like Top Ten or Powers.District X 1: Mr. M showed a strong start for the series. Rereading it, I still enjoy it and wish that it had run longer. I think the comic had a ton of potential. I’d love to see Ismael return someday even for a few cameos. District X 1: Mr. M was followed by District X 2: Underworld. I saw this one on Marvel Unlimited and had never heard of it. I tried this one after thinking, "Oh, look. Marvel's answer for Gotham Central." Of course I figured it would be an epic failure, but let's give it a go, huh? What a pleasant surprise.A local cop who works in a town filled with mutants is paired up with a new partner working for the feds. The new partner happens to be Lucas Bishop and the two set off to work some death investigations that have their cause rooted in drug sales. This doesn't have as big a cast as Gotham Central, which had two full shifts of detectives. It has a bit of the same feel though, but is also different enough to feel new.I enjoyed this one and I'll press on through the next trade. A great read, although I wasn't expecting much. It's one of those Marvel stories that isn't really about the super heroes, but rather about the people on the sidelines. Specifically a cop who frequents the mutant ghetto in New York.MY only real complaint was that I didn't really get why Bishop needed to be there. Was it just for a character with name recognition? He really only contributed to the plot at one point, and if he wasn't there I'm sure they could have just written it differently. This was certainly an interesting look at the mutants in the X-Men universe. Not all mutants are great superheroes, or endowed with great powers. Some are very ordinary, and some have mutations that are less than desirable. In NYC, Mutant Town is basically the poor mutant ghetto. In goes the X-Men member Bishop, a federal agent, to investigate a rising gang war. And meanwhile, the mysterious Mr. M decides to take action in his hands. Overall, this was a different take, and it was pretty well paced. I will definitely look for others in this series. Excelente comienzo para una serie que se iría desinflando un poquito con el correr de los tomos. Por suerte o por desgracia no duró mucho, así que en ningún momento pasó a ser una serie mala. Pero sin duda alguna a esta altura prometía mucho. Y, al menos en la historia propia de este tomo, cumple bastante. El dibujo no es malo pero tampoco sé si está a la altura del guion. De todos modos, hablo medio de memoria, así que seguramente cuando lo relea lo rerreseñe. X-Men sometimes feels a little ham-handed with its political and social messages. (For example, a character explicitly yelling, "Being a Mutant is like being Black!") However, the f***ed up mutant powers and the dark crime dramas that unfold in this book make it a really interesting read for comic fans and X-men fans. One of the best Marvel miniseries I've ever read, full of interesting characters and taut storytelling. Great for Marvel fans who like well told stand alone stories. very enjoyable but definitely feels hampered by Marvel especially when compared to the amazing Gotham Central which has a very similar tack just in a different universe. Interesting characters and a nicely nuanced look at the dark side of Marvel's mutants. It's it a bit too grim at times, however, and the plotting thus far is thin. I thought this was excellent. The art was 5/5, and the story and the setting was incredibly interesting. I look forward to reading the next two volumes. Cops who just happen to be hunting mutant criminals. Excellent.